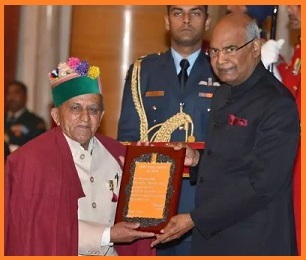 President Ram Nath Kovind presented the Sangeet Natak Akademi Awards for the year 2017 to 43 eminent artists in five categories for the year 2016 on 6th February 2019 at Rashtrapati Bhawan during a special investiture ceremony. The General Council of the Sangeet Natak Akademi selected 43 artists from the field of Music, Dance, Theatre, Puppetry, and Overall contribution/scholarship in the Performing Arts for the Sangeet Natak Akademi Awards 2017 at it's meeting in Imphal, Manipur that was held on 8th June 2018. The Sangeet Natak Akademi Awards are conferred every year by the Sangeet Natak Akademi, the National Academy of Music, Dance and Drama, is an autonomous body of the Union Ministry of Culture. The Sangeet Natak Akademi Awards was established in 1952, this not only symbolizes the highest standard of excellence and achievements but also recognize sustained individual work and contribution. The Sangeet Natak Akademi Awards carries a cash prize of Rs 1,00,000, a Tamrapatra and Angavastram.